After making my tea cozy, I decided that I needed to have a garden party. What is a party without favors? I'll tell you: it's a really bad party! I couldn't just serve tea and cookies to my friends, so I decided to whip up some quick party favors and gift bags for my guests. This is a great favor for any party or holiday. You can change up the paper or theme to meet your needs. 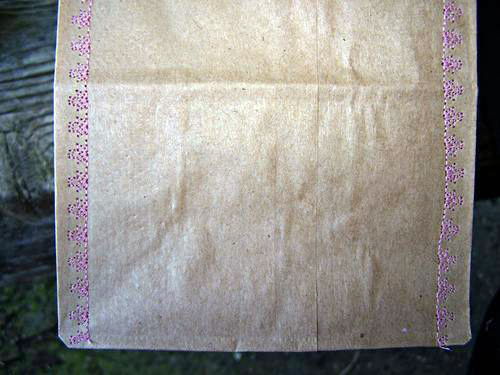 Take your scrapbook paper and cut it into equal part of four (basically in half and then half again). I used a straight stitch for this, but the BERNINA has so many awesome stitches that a decorate stitch would look great! I stitched the long side of the paper and then another side, leaving an opening. Next, I popped open the little "cup" that I made and filled it with candy. I grabbed a little piece of ribbon, cut a flower out of paper and added an inspirational quote, and stitched up the last side. I left a little tag at the end so the person can just pull the thread and it will open up to reveal the yummy treat! 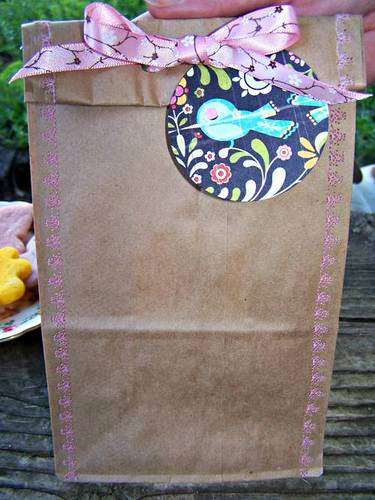 For my party favor bag, I decided to use up all of those lunch paper bags I had from another project. I also decided to use some of the awesome embroidery stitches the BERNINA 330 has to offer. Since I was going for a garden party theme, I chose the flower stitch. I simply stitched up both sides of the bag. I kept yelling at my husband to come look at how cool the stitching was! After I calmed down from checking out the embroidery stitch, I folded over the bag, hole punched two holes and tied a bow. Got my tea cozy, my party favors, now I just need my guests to arrive and I will be ready to kick this garden tea party into top gear! I always love sewn paper, but never have a project in mind. Now I do! I love both of those so much! I can't wait to do some fancy stitch on some cards or something. Ooh, yea, come to the dark side! I love stitching on my cards. They seem incomplete without some kind of stitching anymore. I don't have a fancy machine like this one, though. 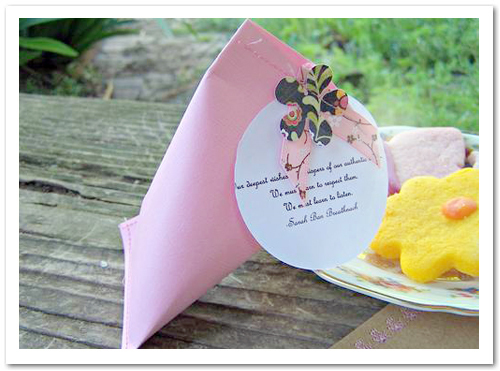 These party favors are really cute! While I am not normally a paper crafter, I would definitely give these a shot - you could also use these for tagged goods and little extras! Love the idea and the way your style seamlessly shows through your designs! So f'ing cute! Keep your needles sharp and happy stitching! Very cute projects, and a great way to get us thinking 'outside the bolt' (of fabric).